Former Arizona Gov. 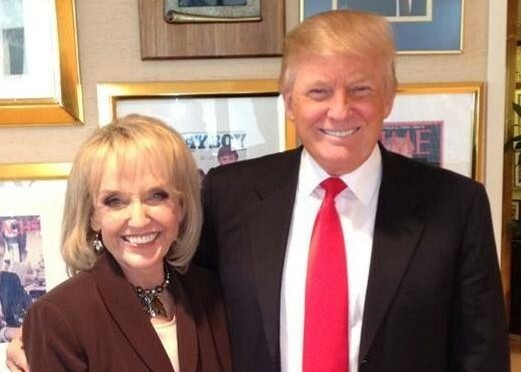 Jan Brewer endorsed GOP presidential candidate Donald Trump over the weekend, citing his hardline stance on immigration. Brewer gained a national profile after signing SB 1070, a controversial immigration enforcement law that highlighted tensions between state and federal jurisdiction. As a former two-term governor, Brewer adds to a growing list of respected Republican politicians who are throwing their support behind the unconventional Trump campaign. In a statement on her Facebook page, Brewer said that “as a Washington outsider, Mr. Trump gets it,” and emphasized their common support of enforcement-focused immigration policy. Trump has promised to increase border security by building a “big, beautiful” wall along the U.S.-Mexico border. He has also pledged to deport “humainly” all of the estimated 10.9 million immigrants in the U.S. without legal permission. Both Brewer and Trump contend that increased immigration enforcement is fiscally prudent and essential for public safety. Brewer’s SB 1070 law sought to wrestle immigration policy from the federal government by making visa violations state crimes. Those portions of the law were struck down by the Supreme Court. One portion of the law, which allow race and accent to be a factor in checking people’s documents, survived the court’s review. At times, both Trump and Brewer have touted blatant untruths in order to argue for their policies. Brewer in 2010 Brewer said that "[Arizona] law enforcement agencies have found bodies in the desert, either buried or just lying out there, that have been beheaded.” Arizona officials later told Politifact that not a single such beheading had occurred, and the claim earned a “[liar, liar] pants on fire” rating. Trump also earned a “pants on fire” rating for his assertion that the Mexican government is intentionally encouraging criminals to emigrate to the U.S.